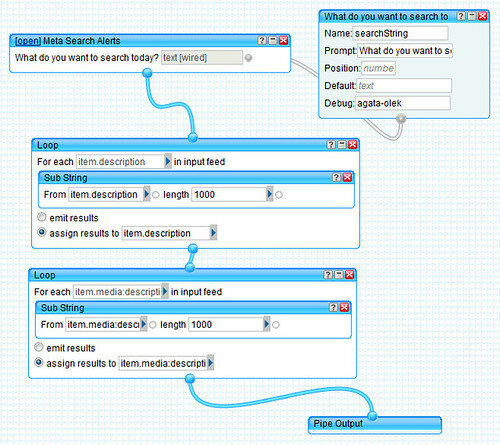 Since publishing Meta Search Alerts (Yahoo Pipes) (Flickr screenshot / SML Pro Blog / SML Wiki) back in 2007, it has become to most popular pipe ever created. It even popped onto ReadWriteWeb's The Ultimate Yahoo Pipes List in 2008. And perhaps even more bizarre was discovering that somehow CNet had stuck a software publisher profile for me on Download.com earlier this year! SML Thank You!!! Meta Search Alerts was originally created for my own vanity searches, but then I started using it on SML Wiki so I can track people and things more easily. This is great until I started writing very long description of photos on Flickr after realising that photos are often referenced as a singular entity — that while you would prefer that people check out the entire set to see the description of the info, most simply don't have the time and patience to do look at them. For the sake of human browsing, including long description (for example, full bio about an artist that I photographed) in everyone of my photographs about them is useful when items are referenced singularly, but then if you know what you are looking for and wish to cluster them in a single place, the content become repetitive and tired after a very brief instant. This is why I created a baby version called Meta Search Alerts Digest. In essense, this pipe uses Meta Search Alerts as a subpipe, then loop through both the item.description and the item.media:description and limit them to 1000 characters. Note: The reason why I use Feedburner to subscribe to feed is because that for whatever reasons, Yahoo Pipes RSS tends to generate errors when subscribed via normal means. Many feed reader would complain that it's not a valid feed. By using FeedBurner to burn the feed, that problem goes away. An additionally good aspect about using FeedBurner is that you also get analytics data that comes with it, which is useful - particularly if you wish to use it to feed TwitterFeed etc. 2. Filters the results and ensures that the links are unique. 3. Sorts the results by date such that the latest addition onto the pool will appear at the top of the list.